Eternal Love is an intense vampire-love themed online slot which runs on Realtime Gaming (RTG) software. The game is designed to operate on both desktop and mobile devices. The slot machine has fascinating bonus features and an awesome jackpot of 50 000 coins for South African gamblers to enjoy. The eerie theme of the slot is conveyed via great graphics and thematic symbols on the reels. Discover the love journey of vampires on Eternal Love by reading our review below and find the best real money SA casinos to play at. 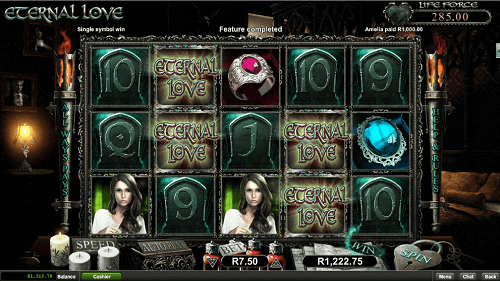 Eternal Love has great game features with the main feature being the bonus game spin round. This round is triggered when players collect three or more scatter symbols during a single spin. The feature awards 10 free spins. On screen, players will see a Life Force Meter which offers values from 3x to 100x the player’s bet amount. The total is revealed once this bonus round is finished. Players have the opportunity to enter the Extended Life feature if the total amount won during the free spins round does not reach that meter. Once activated, this round will offer Mzansi players free spins to utilize until the win amount exceeds the value on the Life Force Meter. With this feature, players can win a total of 1000x their bet amount. The bonus meter increases from 1x to 10x the player’s bet amount. The Wild symbol on Eternal Love is the game logo which only appears on the second or fourth reels. It increases the player’s payouts by as much as 3x when it acts as a multiplier symbol. More so, SA casino players will not be betting on standard paylines since the Eternal Love online slot has 243 ways to win. Instead, players will be betting from 30 coins. The slot machine’s maximum bet is 150 coins and it supports multiple coin denominations. Also, the slot game has an auto play feature which allows Mzansi gamblers to select a bet amount and a number of spins. The reels are spun automatically through this feature. However, you can disable this feature at any time and spin your own reels. Eternal Love is a slot set in a dark atmosphere with mysterious and alluring vampires. The backdrop of the slot includes old temples under a cloud covered night and many bats. Eternal love is not only peculiar themed but also has a deeply romantic and extraordinary storyline to satisfy your desires. South African players must try the Eternal love slot for free and for real money at the best ZA casino recommended below!